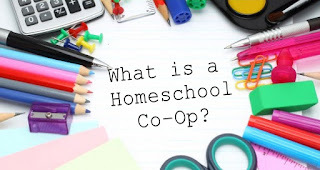 Leading Them To The Rock : What is a Homeschool Co-Op? What is a Homeschool Co-Op? A Co-Op is just short for Cooperative. It is only a true cooperative if the parents all have a job, helping teach or assist in some way. Co-Op are all different, because they are what the Moms make of it. Some meet weekly, some monthly, some for field trips. A Co-op can be big with dozens of families, or just you and one other family. The one thing that is true of almost all co-ops is the parents contribute out of their strengths & abilities. Everyone has something to offer to a co-op. You don't have to be a great singer or mathematician to contribute. Holding babies or playing with toddlers so a mom can have her hands free to play teach art is a very helpful contribution. Some moms bake cookies for the other Moms to enjoy, and as a non-baker, I can tell you this is a worthwhile contribution! My first year homeschooling, I started a monthly Art Co-op with just one other family. We got together once a month to do an art lesson together at her house because it was larger. We split the costs of supplies, and took turns teaching. Our kids ages ranged from my 5 years old to 13 years old. We had about 20-40 min of art (paper mache, water colors, pastels), then let the kids play together while us moms enjoyed coffee and adult conversation (that was my favorite part). We now attend a weekly co-op that meets once a week for 12 weeks each semester, it consists of 50 families. My kids can take classes I can not offer at home. As a former Preschool teacher, I teach the younger kids, while talented singers teach choir and the athletic-minded teach gym. Some Co-ops are very structured. Usually the bigger the co-op the more structure is required. Our weekly co-op of 50 families consists of four 45 minutes classes. I teach preschool 3 out of 4 periods, with one period off for prayer and mom's snack (it's amazing guys). Some co-ops are super flexible, with not much structure. Like I said before, my art co-op was only two families that met only once a month, and consisted of a small half hour lesson and several hours of coffee and small talk with my friend! We are also part of a flexible Co-op that is just a field trip co-op. We take turns arranging fields trips to places like the Fire Departments or to see maple sap harvested in the spring. Sometimes moms form a co-op with a family who id doing the same curriculum as them. They might get together for a Roman Feast after a semester of studying Rome in their perspective homes. Ask around only for families who have your same Teaching Style, and if they don't have a co-op already, make your own!!! That said, my weekly co-op includes several different types of homeschoolers, from unschooling to classical. There are a lot of other activities that are not co-ops. If you are paying someone to teach your child, or are not teaching anyone else in exchange for them teaching your child (i.e. Drop Off your child and leave) , then it is not a co-op. BUT these classes are great opportunities none the less. I know I personally love our AWANA club, which is a drop off Bible club. I need that hour and half to grocery shop by myself!!! With the rise in homeschooling, you can usually find more opprotunites to have your kids take classes outside the home, that are scheduled specifically for homeschoolers. I recommend joining a online support group, like a local homeschool Facebook Group. Most Homeschool Co-Ops do not have a website for security, and just for time saving. A Local online groups of women will have more info about your area, and how to link in.